Your membership to our historical society allows us, in part, to sustain our museum. Your contribution through membership helps us to properly archive the many artifacts we receive from people who are entrusting their valuable part of history with us so that we may display them for others to see and appreciate. Any member shall be eligible to hold office and is qualified to vote. 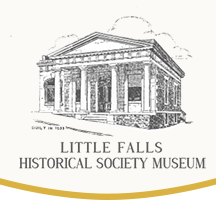 The Little Falls Historical Society consists of individual, family, sustaining, patron, student, and honorary members. Honorary membership may be granted by the Board of Directors to an individual who has significantly contributed to the objectives or benefit of the Society.